Wow. With a name like “Black Sheep Wall” I was expecting something fun, but this isn’t fun at all. Personally, it made me think of some kind of ovine Tetris game, whilst according to urban dictionary it’s a cheat code on Starcraft. But you could never describe No Matter Where it Ends in relation to computer games, be they iconic arcade puzzle or late 90s strategy favourite, unless it is a very long, very gruelling computer game which is in no way enjoyable to play. Because this is music, of a kind which is oppressive, and extremely heavy. Of course, the word “heavy” can mean many things. Here, it seems like the aural equivalent of the way we might use the term to describe a meal. You know- “a heavy meal”. The carb-laden kind where you get full-up rapidly, but still have half a plate of red meat, egg, and potatoes to go when all you really want is two scoops of pineapple sorbet. Well, if you want pineapple sorbet take a city break to Europe, Grandma, because you won’t find it here. No, this is dark and humourless sludge, with many similarities to the excellent Lord Mantis album I reviewed a couple of weeks ago. 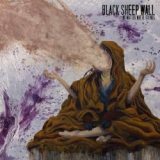 Black Sheep Wall play in an abrasive and stiflingly slow way, often based around one repeated chord for lengthy expanses of time, usually strummed using irregular, difficult-to-locate pulses. It’s like Meshuggah or Loincloth wading through tar. Because it’s so slow and deep, you don’t really notice these complex rhythmic elements until you actually start trying to pick out riffs. Instead this all sort of blends into a stumbling, bludgeoning assault that lasts for a full hour with precisely no let-up except for the freeform noise interlude of Cognitive Dissonance. And when freeform noise is your light relief, things look bleak. So whilst this is harsh and impenetrable, it can also be crushingly effective. Opener Agnostic Demon, for example, achieves quite a powerful effect. Its brutally minimalist percussion thudding- like a more thuggish Neurosis- locks into unison with a monotonous electric guitar pulsation to produce something that is both hypnotic and completely barren. Black Church, befitting its name, starts with a monstrously downbeat sludge riff, and allows hints of sad melodic colour to seep in to add a Scandinavian tinge. All said, this is an overbearing album, daunting to listen to, but with moments that make the band sound like a force to be reckoned with. Now stuff these spam fritters down your contemptible cake-hole, worm.